Today's work desk is a totally different post for me. Last week Steve and I went to an estate sale and FINALLY I found a used sewing machine here in San Antonio! There were actually a few but I picked a Singer 201 and a cabinet. the price went from 165.00 to 65.00 I really felt like given the state of the machine it shouldn't have gone over $50.00 How ever this particular machine is one that I needed for work sewing and thread painting. Before I show you mine and my workdesk, let me tell you what happened when I got the machine home. The machine has the foot controller hard wired to the machine, so it was there. The power cord was not! So I borrowed one from another machine and ordered the cord ($12.00) The machine ran great! But the cabinet was missing the hinge pins! So I ordered those ($7.00) and rigged the machine to sit in the hole so I could use it - I have done this many times before with other machines, it usually works just fine. Well not this time, I stood up and lightly bumped the cabinet and Bang the machine fell through the hole and it the floor!! First time for everything I guess! The machine was fine! However the bake light plug was crushed ( this was the borrowed power cord) No surprise this machine is 40lbs of cast iron! If I named sewing machine - I don't , but if I did this would be Black Beauty. And the foot pedal has had the toe rest sliced off?? This is one used machine!! Today the new power cord arrived and my hinge pins! Here she is all tucked up in her new cabinet!! Cleaned, oiled and given a little TLC! It sews perfectly and has a very good motor. This machine will sew 1200 stitches a minute! I can't wait to start thread painting with this machine!! Thanks for stopping by and don't forget ot go over to Jans Blog to pick up on the rest of the world wide crafty hop!! 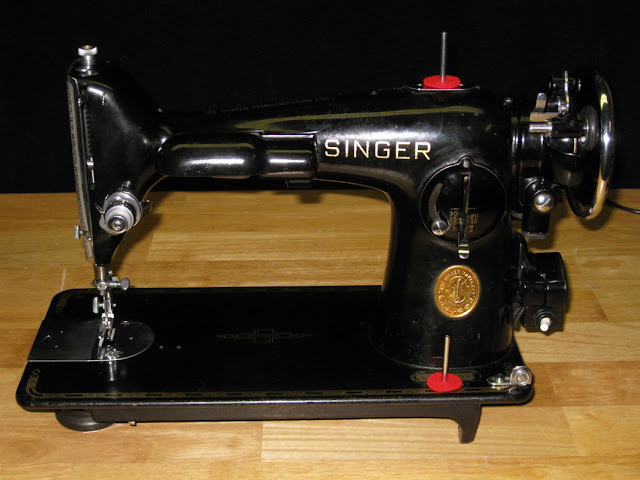 Oh Ginny this takes me back to my mother's sewing machine... it was a post war Singer, I think called a Jubilee model, and was robust enough to be able to have a motor attached in the late 50's. It sewed for many years and did many miles of sewing on it. Unfortunately I was unable to keep it and it had to be sold :-(. I do love you post about this beauty, and all your comments about it - yours certainly has had a hard life, but Singer is always a great machine. What a beautiful sewing machine. Imagine the history of that machine - who used it? What was it used for? There's a whole story in that wonderful machine. I have a very old SInger industrial machine and when I am sewing often wonder who else has sat in front of it and what did they make. Wouldn't be without it you can keep all the modern machines and I have about 5 plus overlocker. My mum always swore by her Jones hand machine and made covers bedspreads eiderdowns etc. Congrats on your purchase! What is thread painting? I have never heard that expression.